The Best Water Bottle…& Free Giveaway! For me, finding the right water bottle is like finding the right car–it’s a life-changing decision! I carry my water bottle around with me everywhere I go, even around my own house, because it’s a spill-proof way to keep water nearby. H20 is crucial to proper body function and feeling thirsty means that the body is already dehydrated. (I also get headaches when I’m dehydrated, so drinking often is the difference between a good day and a terrible one!) I find that when I am constantly sipping I don’t need to worry about measuring my water intake to ensure I get my “eight glasses” for the day–so it’s one less thing to worry about. I took me years of trying different brands and water bottles to find the right match, and I finally had my “AHA” moment when I stumbled upon ZULU One-Touch bottles at Target. Here’s my review and why I them love them so much. NOTE: this is an unbiased review and I am not getting paid or otherwise rewarded to write it. I just happen to love this water bottle and wanted to share it with my readers, because, like I said, it changed my life! The bottle (and spout) are made of GLASS: I ditched plastic bottles years ago when there were concerns about BPA, and, more recently, concerns that chemical substitutes for BPA may also be dangerous. I tried stainless steel, but I didn’t like the metallic taste, and I also like to “see” my water–I drink it more often when I can see it, perhaps because it looks so clean and pure. Glass is safe, doesn’t leach or leave a residue, and doesn’t change the taste of water, so it’s my material of choice for drink and food storage. Zulu’s glass is “Certified BPA, Pthalates, PVC and lead free.” And you drink directly from the glass bottle rather than a plastic spout (as with many other water bottles), which is also important to some people. 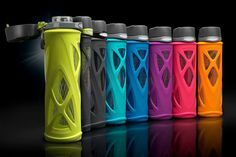 DURABILITY: almost all glass water bottles on the market are covered in silicone sleeves that prevent that from shattering when dropped. Of course, these sleeves are not 100% foolproof–if you drop a bottle with a certain amount of force (or throw it, as happened during one of my kids’ outbursts) it breaks. My Zulu bottles–my family has been through a few, so we’ve owned a bunch over the years–withstand a bunch of drops. This may be a result of their “extra thick” glass and “extra thick silicone bottom.” I found the Lifefactory and Ello water bottles to shatter more quickly–I did not do an official test, but this was my experience over repeated use. Zulu’s lids/spouts are more durable, as well. My Ello’s flip lid started to come apart within a week of use. Zulu’s lids are very sturdy. 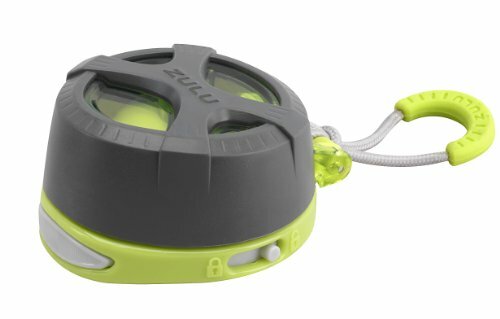 Virtually SPILL-PROOF: Though Zulu bottles come with the different tops, my favorite lid–the One-Touch–has the ability to “lock” closed, so it won’t pop open in your bag (as happened to me many times!). This locking function is so smart and I don’t know why other brands haven’t copied it yet! The One-Touch top is SUPER FUNCTIONAL: I need to be able to open the bottle with one hand, so I can drink water while I am driving or holding a kid (or anything else). You just squeeze the large “button” on the top and it flips open. Ello has a similar top–but it doesn’t lock to prevent spills and it breaks easily (see #2 above). There’s also a loop attached to the lid, which I use to hang on my stroller hooks. GREAT PRICE: Ranging $12.99-14.99 (depending on the lid type), they are cheaper than many other options on the market. Find them at Target stores and target.com (they’re much more expensive on Amazon!). 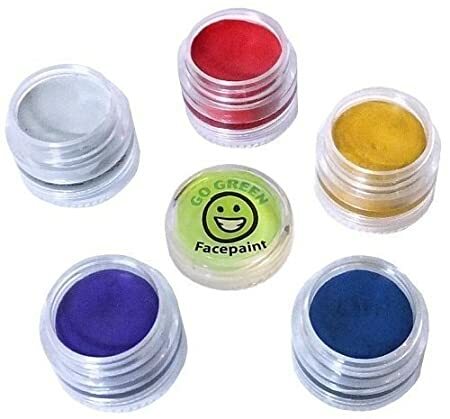 They LOOK GOOD: They come in a range of cool colors. Try them our and let me know what you think! You can read more about the bottles on Zulu’s site. FREE GIVEAWAY TO TWO LUCKY READERS! I contacted Zulu and they offered to do a FREE GIVEAWAY! Two readers will get a free Zulu water bottle in their choice of color and with their choice of top. See my Facebook page for details! Giveaway period ends on 3/20/15 @ 11:59pm. Categories: Review | Tags: BPA-free lunch containers, Glass Water Bottle, Review, Safe Containers, Water Bottle, Zulu | Permalink.